The iconic shot of the athletes wearing Wimbledon white, running through the beach, splashing water in slow motion set to the synthesized grandeur of Vangelis's score buoys most of this picture. Looking back, the story of a group of British track and field athletes and their collective journeys to the 1924 Olympics in Paris, fighting for King and Country, is as stuffy and stodgy as British period films come, and is arguably one of the least memorable Best Picture Oscar winners. A dual story essentially, Ben Cross, as Harold Abrahams, is a dash-runner and a Jew, who at every turn battles the stubborn, racist British class system, as well as his feelings of self-doubt. Eric Liddell (Ian Charleson) also runs the 100-meter dash but is a devout Christian and, compared to Abrahams, Britain's golden boy. This is ripe material for dramatic conflict, but director Hugh Hudson never finds the core that connects these stories. Colin Welland's script hops and skips through the years leading up to the Games, but with little dramatic gravitas. Abraham's fight for recognition as a Jew in the mostly Anglican Christian Cambridge school mildly exposes Britain's legacy of elitism and class hierarchy, but it never really passes any significant judgment. 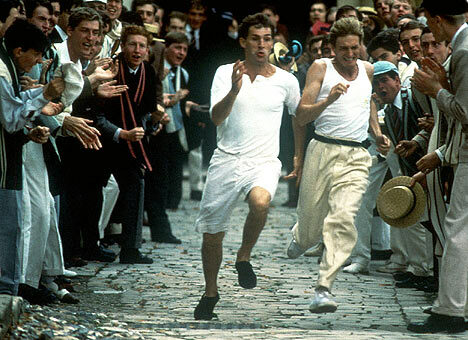 And Eric Liddell's moral stance about not running on Sunday is admirable but hardly heroic or rousing entertainment. Hudson, who came from the same background in British commercials as Ridley Scott and Adrian Lyne, creates a handsome production but shows little of the visual inspiration or inventiveness of his contemporaries. Other than his expressionistic use of slow motion, Hudson's imagery carries very little drama or emotional weight. Even the sports scenes fall flat. None of the main players ― Charleson, Cross, Nigel Havers or Nicholas Farrell ― look like athletes at all. The Vangelis score is still the highlight, a copy of which is included as a CD in the Blu-ray packaging. The electronic synth sounds date the film to the '80s, but it's the best of this unique era in film scores, providing the only memorable counterpoint to the film's otherwise restrained stuffiness.